Archive for the ‘Modesty’ Category. I’ve had my fair share of shopping trips where my daughter and I disagree about what is appropriate. 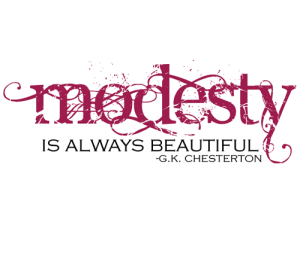 So, I was thrilled to hear how a friend and her brother learned about modesty from her mom and dad. My daddy made me feel like a princess. He loved me no matter what, and he told me I was beautiful. He and my mom built on that basic security by teaching me modesty in a unique way. It was time for school shopping! I couldn’t wait to get new clothes! Even better, I could show them off for Daddy in tonight’s family fashion show! My dad was a great sport. He sat through countless fashion shows, some long and some short, over the years. He ooo-ed and ahhh-ed and told me I looked cute, fun, and beautiful. What a great daddy! As I got older, my mother explained to me how important modesty is, and when we were shopping, we kept that in mind (and conversation). If we had any doubts about something in the store, we talked about letting Daddy decide. A really cool addition to this tradition was that my older brother participated, too. As we started high school, he gave his opinions as well. There was mostly brotherly teasing sprinkled with some genuine compliments , but what I remember most is the one or two times that he said, “No.” I listened to what he had to say as a teenaged boy, and I avoided clothes that might have sent the wrong message. The beauty of this system was in its positive tone and family unity. What did my parents accomplish? I was closer to my daddy and my brother. My brother was trained to look at clothes critically and seek modest girls to date. All this from a fashion show! I’m so glad my parents were willing to spend the time to teach me and lavish their love upon me! God blessed me through them. Jennifer is a dear friend and neighbor (and mom of 4 boys under 10!) and I’m thankful to her wise parents for the generational impact they are having from making use of those teachable moments! We have already been blessed by this idea for a couple of shopping trips. It has made my daughter mindful when making choices that dad and brother will have to “approve” and it takes the heat off of me, co-shopper mom, from being the “nagger!” Whew! On the way home from one shopping excursion, I commented that I was glad she made the choice to get the pants a size bigger. Nine year old brother from the back (who we never think is paying attention, but always is!) quickly added, “Yeah, those other ones were too tight!” Woohoo! Little bro is already learning what’s appropriate from his side of the picture. And, at a more recent visit to the store for swimsuits (heaven help us…literally! ), it made all the difference for my daughter in her choices knowing she was going to have to get thumbs up from her daddy and brother. Hmmm…I just realized I don’t have “Modesty” as a topic in my book, Parenting with Scripture. However, I think many of the verses and principles from Integrity, Character, Example, Beauty, and others cover the topic in one way or another.